A magnitude five aftershock struck Christchurch last night, the largest aftershock since February 22nd when the damaging earthquake struck. A magnitude 5.1 earthquake struck 10 km east of Christchurch at 9:47 p.m. last night. For such a significant aftershock it is surprising that little data is available from GeoNet more than three hours after the event. GeoNet’s report states that the earthquake was 10 km deep but, in a departure from normal practice, omits information on the epicentre in relation to at least two other significant towns. 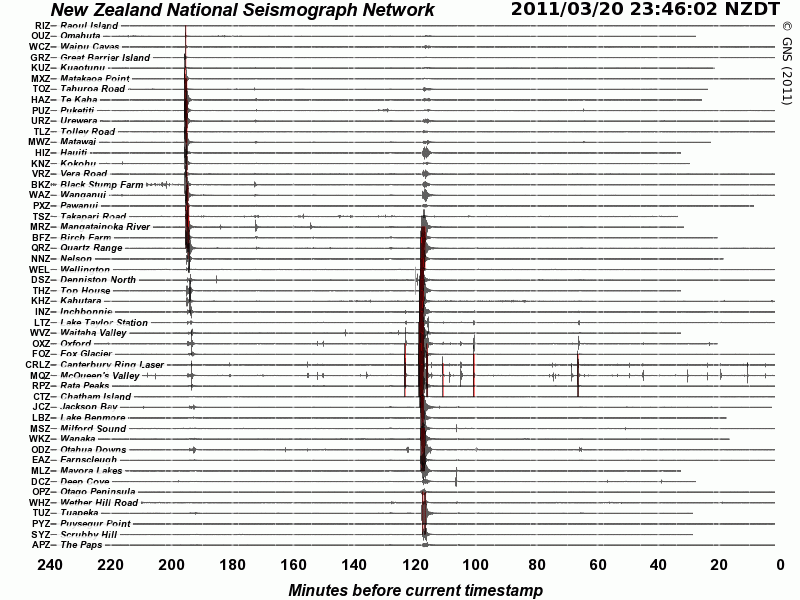 [click to enlarge image] GeoNet’s national seismograph network clearly shows the trace of last night’s aftershock in Canterbury. Ignore the trace at the 200 minute mark, that relates to an earthquake that occurred just after half-past eight last night and caused MM3 shaking in eastern parts of the North Island from Te Kaha to Hawke’s Bay, but the earthquake has not been reported by GeoNet. Also ignore the disappearing traces to the right of the image caused by GeoNet’s webpage not posting updates from its network. This is not an uncommon problem for GeoNet and has been observed on two other occasions over the past weekend, with one event showing a significant failure of their monitoring network. The trace at the 120 mark shows the shaking recorded at the seismograph sites listed down the left-hand side of the page from last night’s magnitude 5.1 aftershock near Christchurch. Last night’s aftershock was the third largest aftershock recorded since February 22nd, the day that the magnitude 6.3 earthquake struck. Three magnitude 5 aftershocks struck on the same day as the magnitude 6 event. They were a magnitude 5.7 quake at 1:04 p.m. (13 minutes after the damaging magnitude 6 event), a magnitude 5.5 quake at 2:50 p.m. and a magnitude 5.0 event at 4:04 p.m. Last night’s aftershock was 10 km deep compared with depths of between 6 and 12 km for the February 22nd events. Respondents to the GeoNet website report that last night’s magnitude 5.1 quake was slightly damaging in Christchurch and in suburbs to the east, with strong shaking confirmed over the same area. The extent of damage from last night’s earthquake is unclear with some residents reporting broken pipes, water on properties, sand fountains, and items thrown from shelves inside houses. The quake struck just before 10 p.m. during autumn, and many respondents seem unwilling either because of the weather, or because they are simply â€œfed-up with aftershocks,â€ to investigate possible minor damage before morning. Buildings in the cordoned-off CBD are being assessed after last night’s significant aftershock. Members of the public report that the Hotel Grand Chancellor, which developed a worrying lean after the magnitude 6 quake, is still standing after last evening’s aftershock. This entry was posted on Monday, March 21st, 2011 at 1:33 am and is filed under Earthquakes - Observations. You can follow any responses to this entry through the RSS 2.0 feed. You can skip to the end and leave a response. Pinging is currently not allowed. ChCh must be sick of them by now!